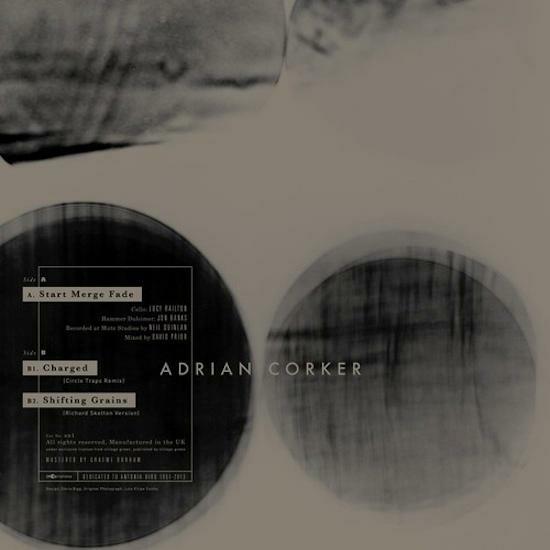 This week, composer Adrian Corker has released his new EP, Start Merge Fade. Alongside an extensive body of work producing music for films, Corker has previously formed one half of Corker/Conboy, a duo with Paul Conboy, and last year put out a solo full-length, Raise. As well as Start Merge Fade's title track (listen below), a piece written for hammer dulcimer, tape and Moog performed with cellist and LCMF curator Lucy Railton, it also features two remixes of tracks from Raise. Circle Traps, the electronics trio of Jack Wyllie, Duncan Bellamy and Will Ward give 'Charged' a glitchy, shard-like remix, while Quietus favourite Richard Skelton provides his take on 'Shifting Grains', distilling the piece into a spectral, circular surging. The EP also marks the inaugural release on SN Variations, Corker's new label "set up to document dialogues between various strands of electronic and new music". We asked him to tell us a bit more about the record, and he's been kind enough to give us a first play of the reworks, which you can hear below. Can you tell us a little about your background as a soundtrack composer, and how you came to these compositions? What's been the biggest learning curve moving from soundtracks to standalone pieces? Adrian Corker: The director Antonia Bird found an album I did as part of a band and asked us to write the music to a film called Face, which strangely had Damon Albarn acting in it. This opened the door to that world and my relationship continued with her up to her death last year. The new EP is dedicated to her. She was a special person in the film world, with strong, compassionate politics central to her work and a real care for the people she worked with. I think there is going to be a retrospective of her films next year at the BFI curated by Mark Cousins. So my standalone music has always existed before I wrote film music but then they have kind of run parallel to each other. When I started as a solo artist a few years ago, the first few projects I did were for film but I was already writing my own material for an album release. I was just slowly working out my sound, since my work up to then had always been part of bands. My music always has seemed to have some affinity to picture but I feel my solo standalone work points in different directions... Maybe my interest goes back to growing up in an era of great, less generic film and TV music, everything from the Radiophonic Workshop through to some of seventies American cinema which percolated through from an early age. I have been less into the language of a lot of modern film music but films like Under The Skin and Mica Levi's score maybe hint that things are hopefully changing again. You've worked with members of the Portico Quartet, Elysian Quartet and Lucy Railton, among others; what do you look for in collaborators? What are your key non musical influences and inspirations to the Start Merge Fade EP? AC: Just trying to do something with conviction and heart. AC: Autonomy. Not having to answer to anyone else except the artists you work with. I will still put out some of my projects on other labels if it makes sense. Also, the label will release new recordings of contemporary new music by current and older composers alongside music from the world of current electronic music, so it isn't just about my music. These are new kinds of collaborations for me and I find that exciting. We are talking about recording pieces by Lucier and Scelsi, recordings of Shakuhachi as well as working with people working in other more electronic/digital forms. And can you tell us how you connected with Richard Skelton, and what it is you admire about his work that made you want to ask him to rework 'Shifting Grains'? AC: I liked his music and writing and his whole aesthetic with Autumn and Corbel Stone Press and bought some of his editions off him. Then the year before last as part of these sound art installations in London I have been curating called The Silence Between, I asked Richard to do a show. While talking to him about this I asked him to do a remix at the same time. I finally met him and Autumn while installing the show last year and liked them very much as people as well. I was interested as to what he would do with a piece written for a string quartet and in the end he did something I didn't expect at all, which was great.